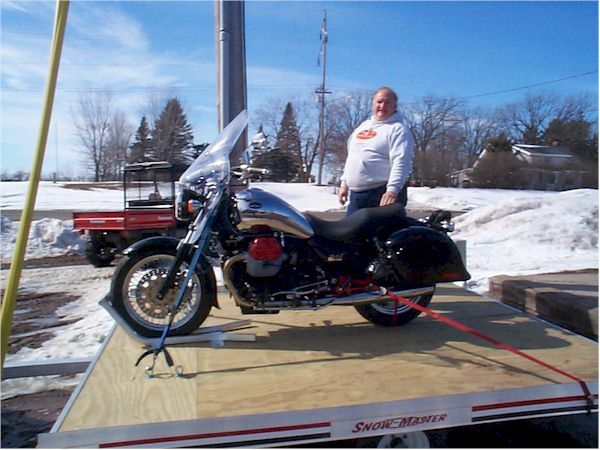 The above photo was taken February 18, 2002 at Caswell Cycle in Mora Minnesota on the day I delivered my 2000 Jackal there to trade it in. If you look closely you will notice that the muffler and muffler bracket is missing. 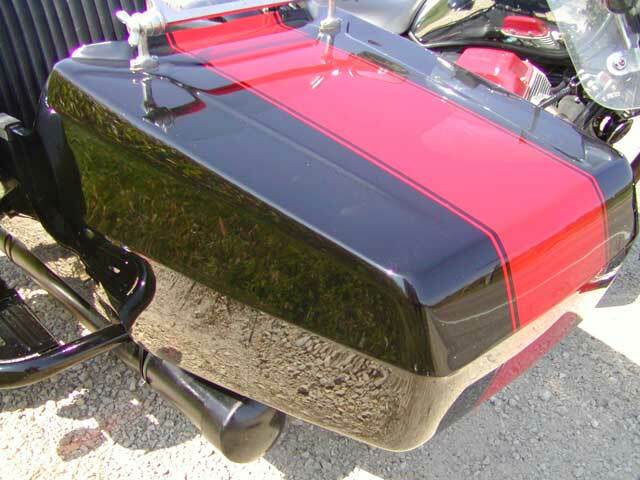 The bracket and a set of valve covers are have been sent out to an auto parts powder-coater and are being powder-coated red to match the stripe on the tank. The tank is Chrome and say's "80th Anniversary" on it. Supposedly there will only be 40 Stone Metals imported to North America so this should be a rare bird indeed. 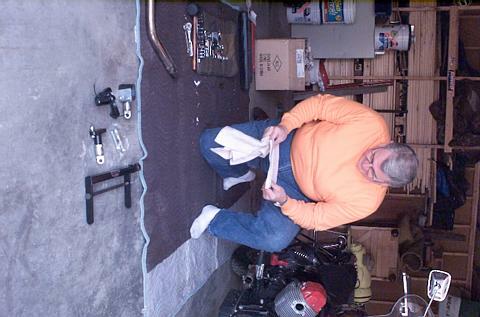 The mirrors both were damaged in transport so we are putting on larger aftermarket mirrors. 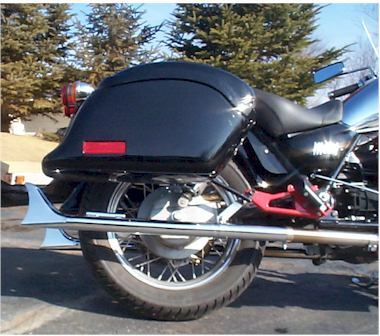 It also will have straight fish-tail exhaust and a Moto Guzzi "California Touring" windscreen. 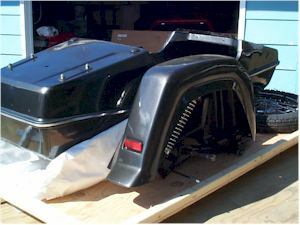 Les Caswell will be removing my National hard bags from my Jackal http://www.sheldonaubut.com/bikes/jackal and transferring them to the Metal. 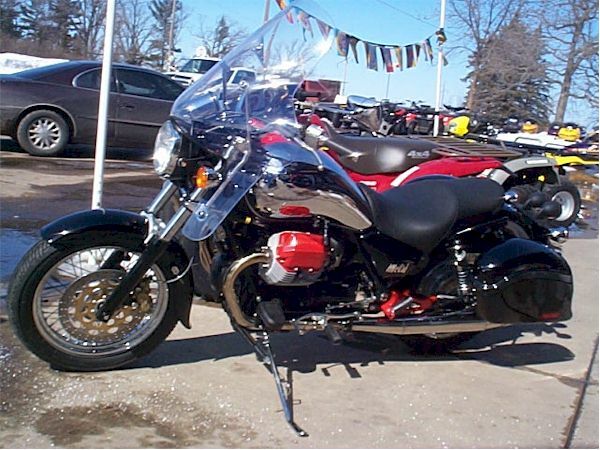 It should be quite the bike by the time I pick it up on March 12th. Once the bike is broken in there will be even more changes. 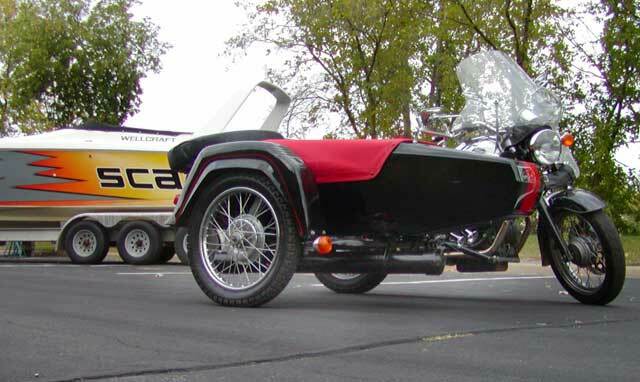 We'll be putting a "Flying Tiger" sidecar from Dauntless Motors on it. 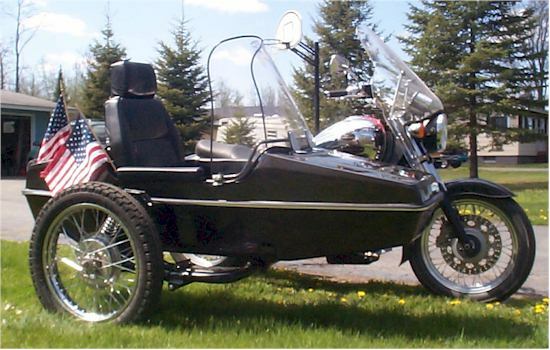 Check it out at http://www.dauntlessmotors.com It is a Chinese, police-style sidecar on a Russian Sputnik frame. Today was the big day. 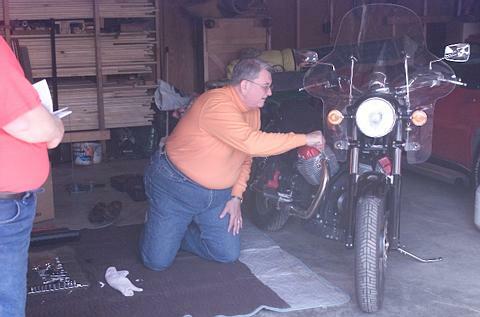 Yesterday I talked to Les Caswell and he had the bike ready, except the pipes. 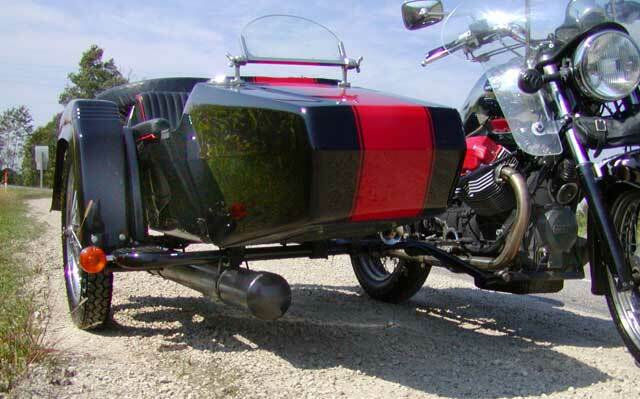 Turns out that with the bags on the bike the fish-tail pipes need a 12 inch extension to clear the bags. He has a local auto parts guy that makes pipes to order but he is out of town on a fishing trip. 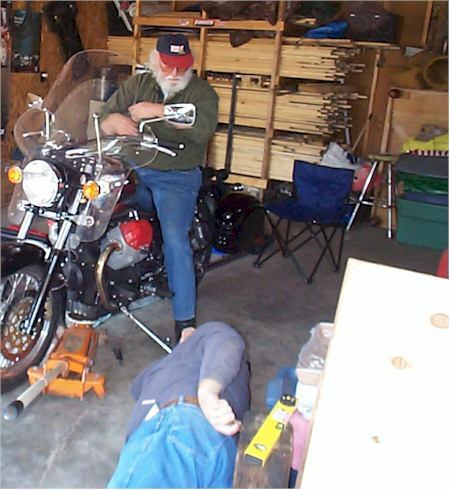 I told him that I might, or might not, pick up the bike today. My thinking was that I would rather wait a week until I have the whole show, but I told him I would call in the morning. So, I wakened this morning to a bright, sunny day with a weather report of clear skies and 35 f. (2 c.) and my first thought was "nice day for a drive". I should have known that I wouldn't be able to wait. I started to get the paperwork together and ran into a huge problem. I couldn't find the title for the Jackal!!!!!!!! Tore the house apart looking for it. I am generally very, very organized but of late I have gotten a bit loose and I now have piles of papers on my desk. I have several large file cabinets in my garage shop where I keep all my files on vehicles. The Jackal file was there but no title. Panic started to set in and after looking for an hour I finally called Les and told him we might have a problem. I then called the county assessors office to find out what I can do if the title is lost. They said I would have to apply for a new title and it would take 8 to 10 weeks and I couldn't trade the bike till I had a title! Argh... Then I went through every piece of paper in my desk, in the file cabinets, the cabinets behind my desk. I probably shuffled through enough paper to create my own public library, but no title. I had started looking at 8:00 a.m. and by 10:00 I still hadn't found it. I got to thinking that maybe I had never even gotten it from the state. 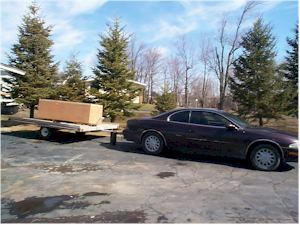 In December we had bought a used Buick Riviera and on a whim I looked in that file. There it was! I had misfiled it! Eurekaaaaaaaaa!!!!! Now I could go get the bike. By 11:00 I was on the road pulling a trailer. Patti had hurt her neck in December and is scheduled for surgery the end of this month and she was hurting today so I went alone. Stopped along the way to get donuts for Les and his crew and when I got there I walked in to deliver them. After setting them down I asked Les where the bike was and he asked, "You just walked right past it." Sure enough he had it right in the middle of the sidewalk entrance to his building. I had to walk around it to get in and never noticed it. I must have had everything but delivering donuts blocked out. There it was and was it beautiful. 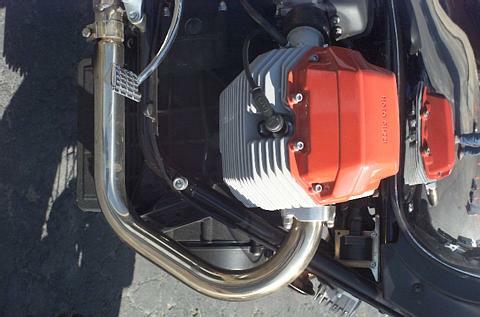 The red valve covers and muffler bracket/rear peg bracket sure brought the whole thing together. But it was sure missing the pipes. Les brought one of them out and held it up where it would be when mounted. I can hardly wait until I get them on. It should be soooo sweet. It's starting to look pretty darn good. 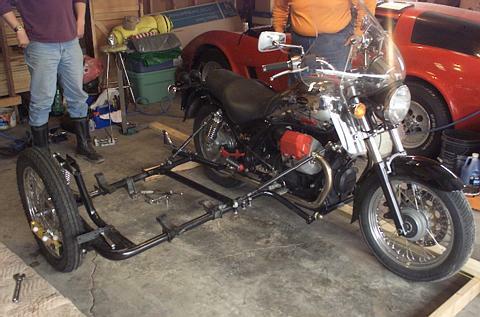 The pipes are going to look awesome and I can't wait till the sidecar is on. This is the type of car I will be installing. 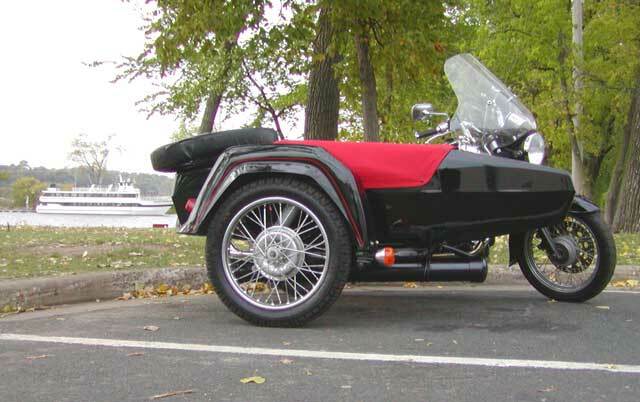 It is a Russian Sputnik frame with a Chinese police-style car from Dauntless Motors. One thing that I find interesting, now that I have given it some thought, is that on the red stripe on the tank it says "80th" and under that "1921-2001". This is 2002 Stone Metal... Seems they are about a year late on this. Wanted to ride today but it snowed last night. Just a couple of inches but enough to mess things up. It's melting quite fast but the roads will be salt water covered and I am not ready to expose this bike to that kind of abuse. I rode a bit yesterday. The road were mostly dry but there were a few wet spots. 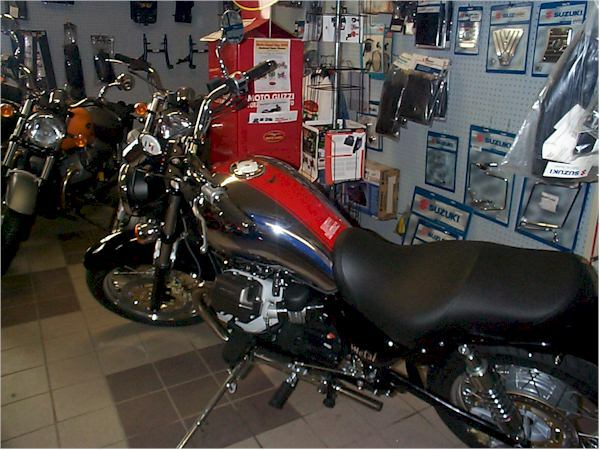 I also stopped by the local Kawasaki dealer and showed the bike off. Drew a bit of a crowd of employees and customers. Can't wait till the weather warms just a bit. Finally got a day when the streets are relatively dry so I took the Stone Metal out for its first real ride. Did about 80 miles and had a huge problem. Riding along in traffic at about 40mph the bike started to stumble, then backfired a couple times and cut out. I was in the left lane at the time and had to stumble my way over to the right side of the road. Pulled over and hit the starter and it started right up and seemed fine. Made a corner and a block up it did the same thing. This time when I hit the starter nothing happened. Had juice to the dash lights but nadda from the starter. 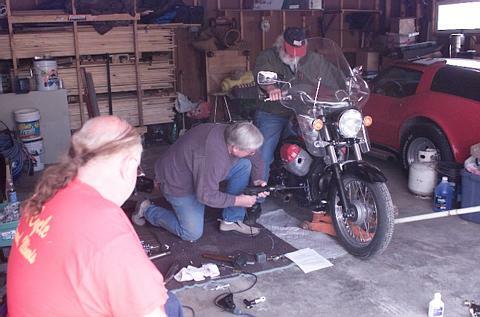 Put the kickstand down, got off, looked around a bit, got on and hit the starter and it worked. Rode another 30 miles with no problem. Mixture of city, highway and freeway. About 60 miles into the ride I was going around a curve on the freeway doing about 70mph passing a string of slow moving vehicles that were in the middle lane and it starts popping, backfiring and losing power. I weaved to the right between a couple cars who I'm sure know I was having problems as the backfires were quite loud, and I rolled to the side of the right lane. Absolutely no shoulder here on a bridge so I was in a pretty dangerous spot. Hit the starter and it started right up and seemed fine. Rode all the way till about a mile short of my house. Accelerating up a little hill and it did it again. This time nothing at the starter. I put the kickstand down, put it immediately back up and it started right up. Argh..... 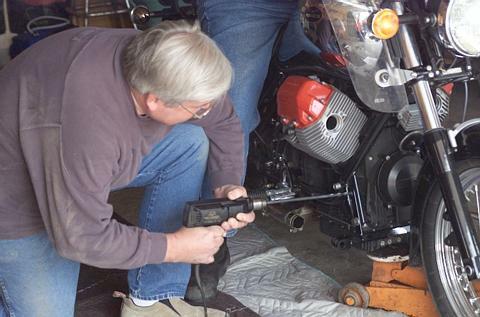 The new kickstand starter lockout????????????? Still haven't had a chance to look at the problem. The weather has been really weird, snowing blizzard conditions for an hour or two then sunshine and melting for the next couple hours. The roads are a mess so no chance to take it for a ride if I make changes. It will probalby have to wait till mid-week before I get a chance to look at it. The weather finally turned here and it got up in the high 40's f. here today so the electrical problem with the Stone Metal got attention. First thing I did was take off the side cover on the steering head to look for the connector as there was on my Jackal. There was no connector there just a solid piece of wire from the sidestand switch that now snakes under the gas tank. I then laid on the ground and got a close up look at the switch. It was tilted just a bit and seemed to only be making cursory contact with the stand. 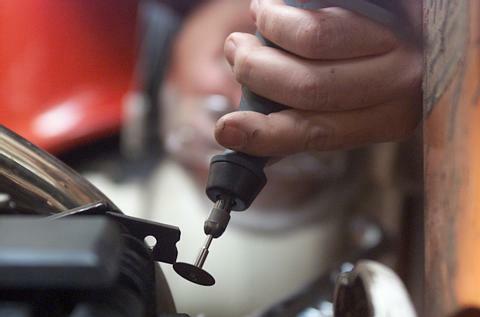 So, I loosened the Allen-head bolt holding it in and adjusted it, and on the kickstand there is now a small bolt with a locking nut on it that the switch contacts so I gave that a little adjustment. 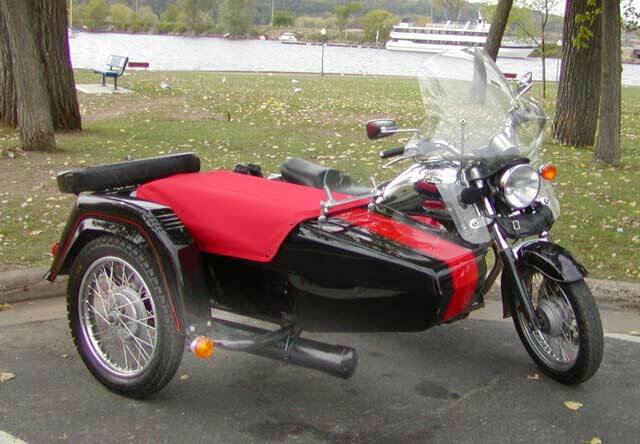 I then took the bike out for a ride around the block to check it out. 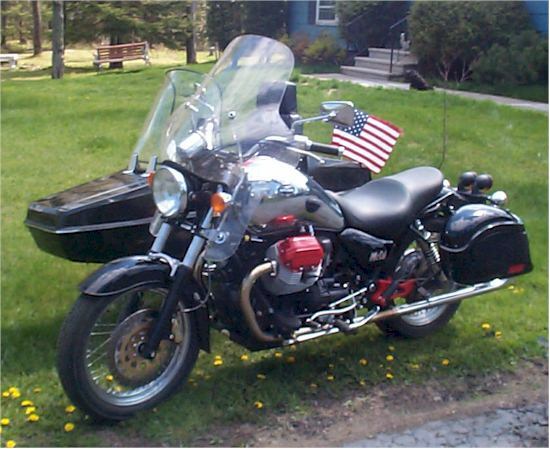 Well, one does know how that goes on a Moto Guzzi... 120 miles later I returned home. The Metal runs like a clock. Oh is this thing sweet. The "California Touring" windscreen makes all the difference in the world. On the Jackal the small police style screen was worthless and when passing semi-trucks it was like a sail tossing the bike around. 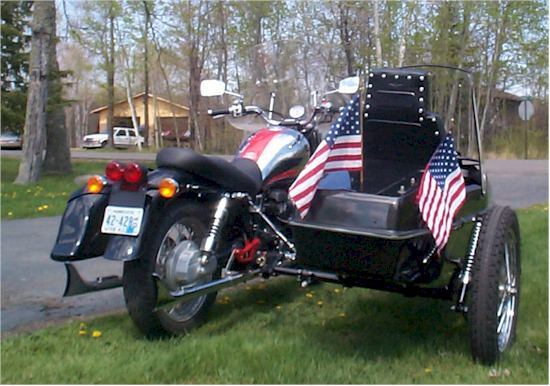 I passed several of them today at over 90mph and the bike was as stable as if it were glued to the road. 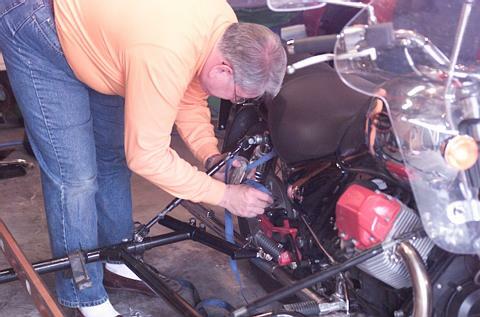 I've got a couple days to get 500 miles on it so I can have Caswell's do the first maintenance at the same time he puts on the fish-tails. I got a nice book royalty check in yesterday's mail so I'll probably have to give some thought to what else I can do to it. 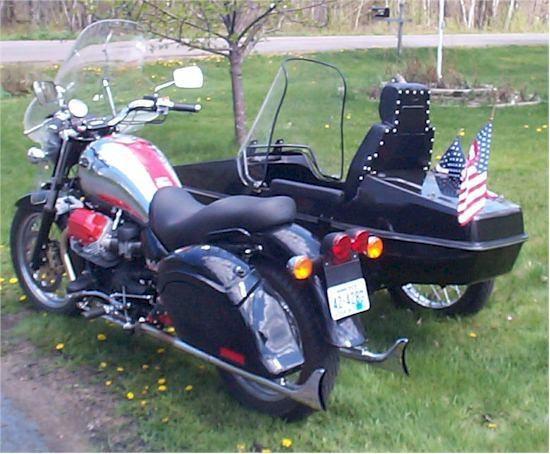 Sent off the check last week for the sidecar so it should be here in a few weeks. This is just too much fun eh? 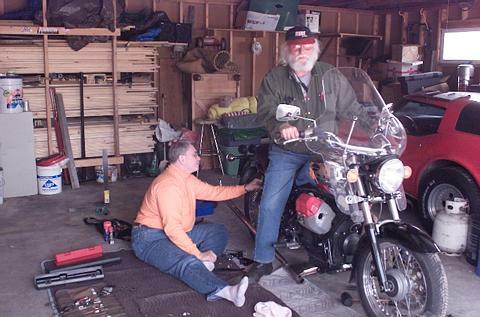 Later in the day I went out to put the bike away and decided I needed to at least go for a little ride before it went in the garage. Of course it ended up being another 40 miles. Today I rode to Caswell Cycle to have the pipes installed and have the first service. Unfortunately we had hard rain the last few days and I wasn't able to get any miles on, so when I showed up there the bike only had 360 miles on it. Les said that was too early for service so I would probably have to bring it back next week. Oh no, another excuse for a 200 mile ride! 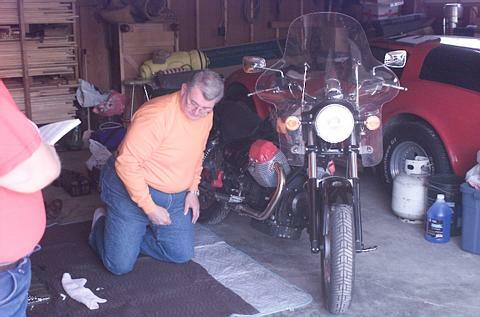 When I bought the bike there were cracks in both mirrors. 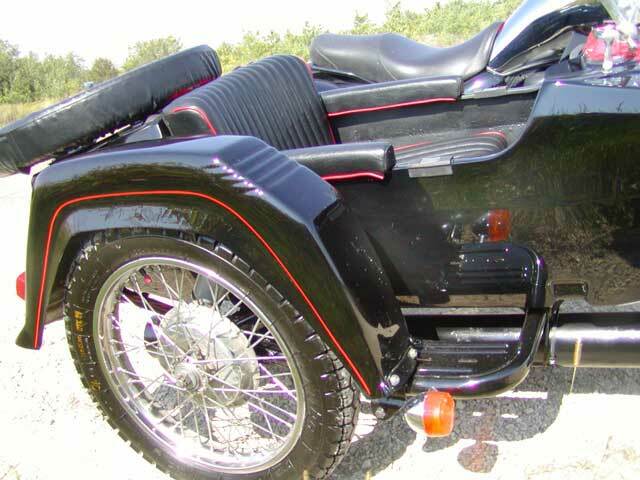 The Stone comes with little round mirrors on short stocks and when I sat on the bike about all I could see in them was my shoulders. If I were a skinny little mouse they would have worked great, but seeing as I am a bit "burley" they didn't work at all. 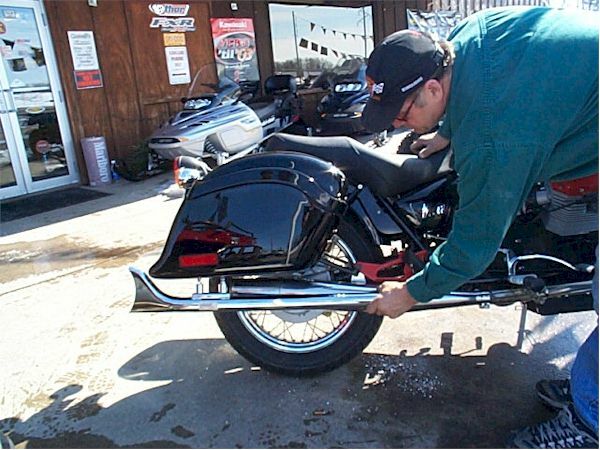 I told Les that I would accept after-market mirrors as replacements for the ones on there so when I picked the bike up it had large mirrors on long stocks that worked great. Until I rode the bike. They rattled as if something inside was loose. When I showed them to Les today he said, "no problem" and replaced them with a slightly different style, and they are great. With the large bars on the bike and these mirrors with thick stocks and large viewing area I finally have a bike that I can see something in the mirrors. Don't know that I've ever had that before and it is a pretty cool experience. Finally I went outside and sat on an ATV in the sun while I waited. While sitting there I heard a low rumble and Les pulled out from between the buildings on my Metal. He gave me a look, with a huge grin on his face, and yelled, "You're not getting this back." 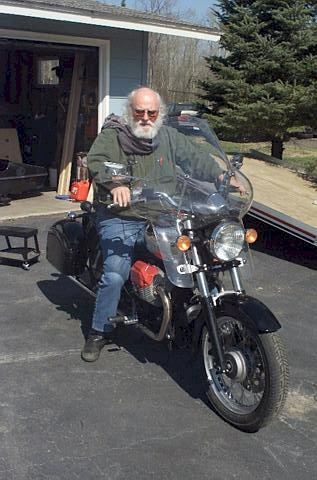 He rode out onto the highway making the most wonderful rumbling music that I have ever heard from a motorcycle. 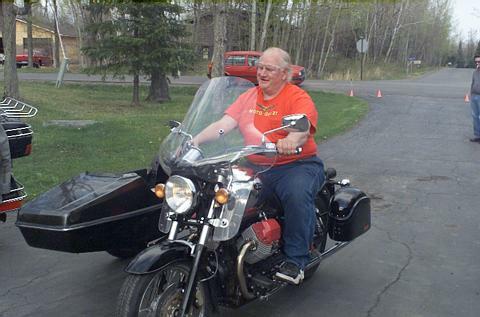 As he rolled on the power it picked up the tempo without being "loud pipes save lives" loud, but rather a rumbling low tone that is oh so wonderful. 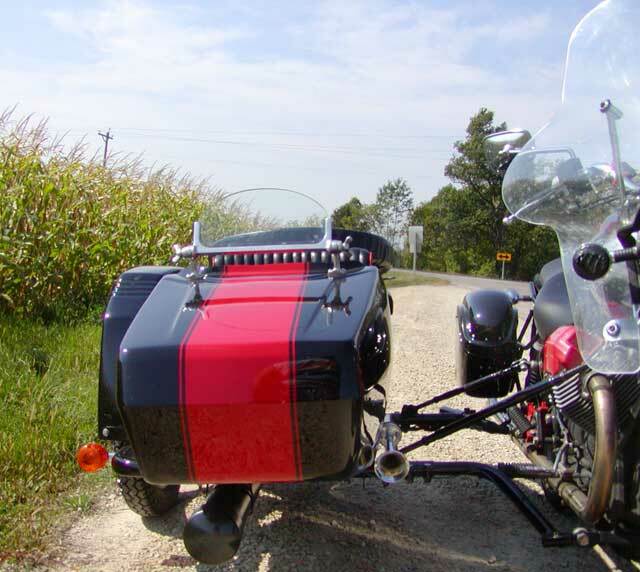 He rode up the highway and I could hear him only for a couple of blocks then a minute or two later the came by the shop at speed and it made the best sound I have ever heard a bike make. When he finally returned he was no longer grinning, now he just plain laughing. 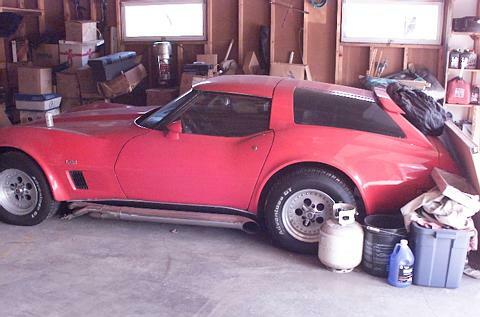 This thing sounded so sweet, and opening up the pipes seemed to make no difference in the way it ran. We had left the crossover on it so there should be a bit of backpressure yet but now we get the benefit of the true sound that one of these Italian bikes can make. It really is music. 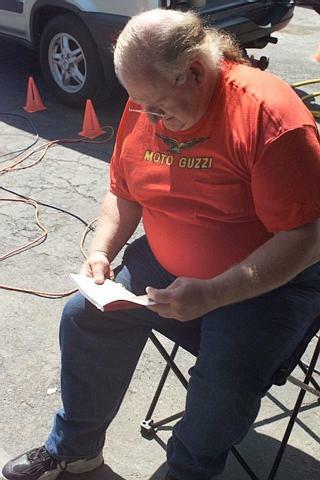 John Zabrocki at Silverbrook Embroidery is making me up a hooded sweatshirt that says on the back, under the Moto Guzzi Logo, "Thatsa notta noise, ettsa music." Saw the prototype yesterday and the shirt should really state exactly how I feel about this bike. 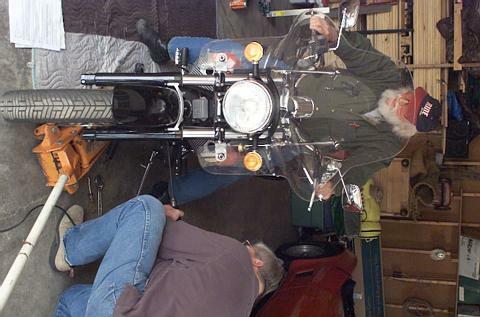 I rode it home grinning all the way, with my old pipes wrapped and bungeed to the back seat. 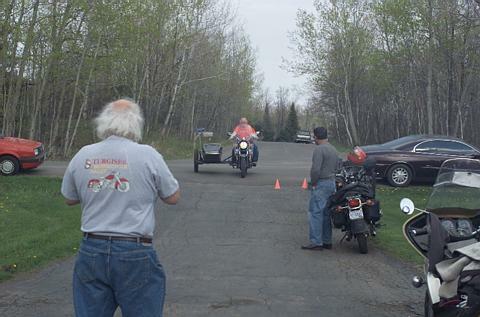 Later in the day I took it for another ride into Duluth. While riding I kept thinking that after something like 38 bikes in my life this is the first one that I really have made my own, and exactly what I wanted. 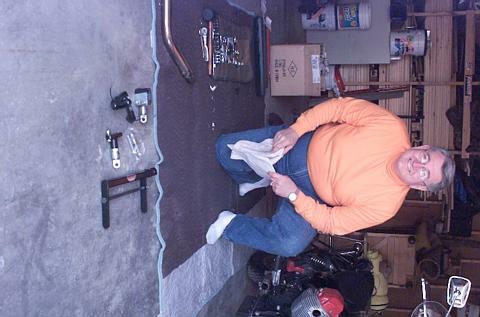 I've had a few show bikes before but they will built more for show than go. 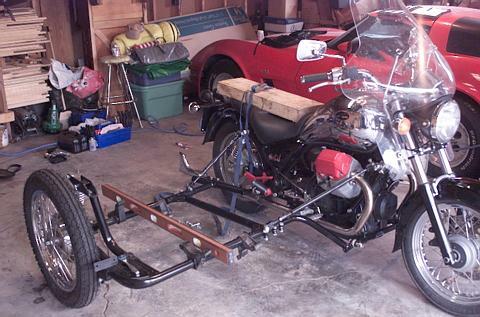 This thing is built for both and is precisely what I have worked all my life to attain. 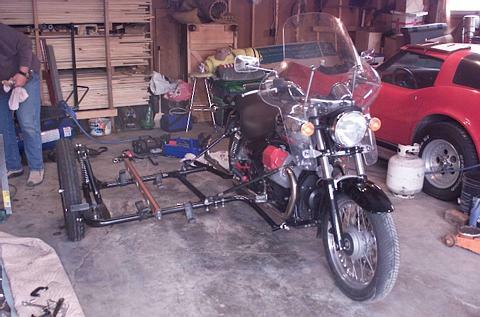 Of course it is still missing the sidecar but that will be along shortly. 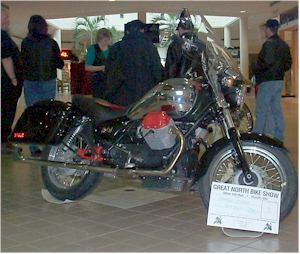 It was snowing like mad this morning and I had to take the bike the "The Mall" for an ABATE bike show. Had polished up the bike the night before but by the time I got to the mall I had to spend another two hours polishing again. It was 30 f. and snowing all the way there. The roads were very wet and I got soaked. 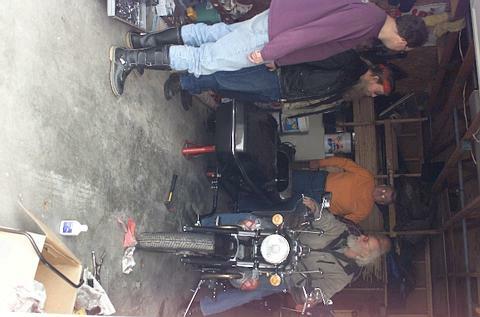 The show was almost all Harleys, other than my Guzzi, two old Cushmans, one Ninja, a Kawasaki and a Honda. There were about 40 bikes total but I am sure there would have been a lot more if the weather wasn't so bad. 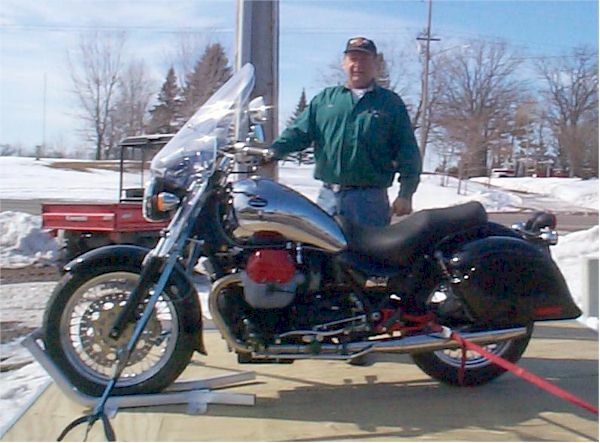 Spent the whole day at the show answering questions about the Guzzi and manning the Wolf's Head Rally/Lake Superior Circle Tour booth. 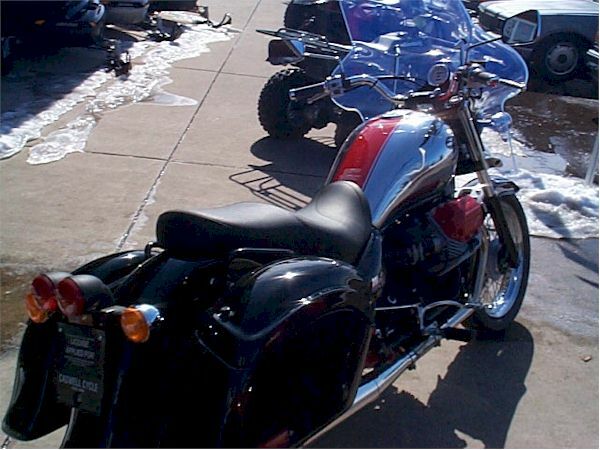 A lot of folks came by and voted for my bike but I don't think I had a chance of winning with all that Harley Iron I was up against. 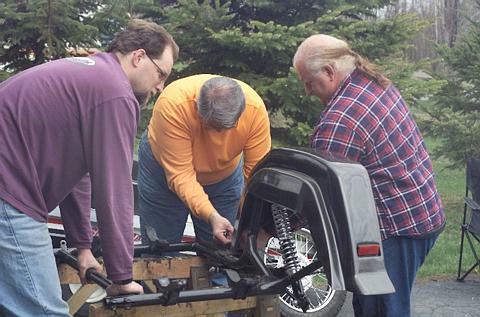 I'm sure that they would find it hard to vote for a European bike. But I had a good day. Got a bit panicky at the end though as it had snowed all day and there was about 4 inches on the ground. 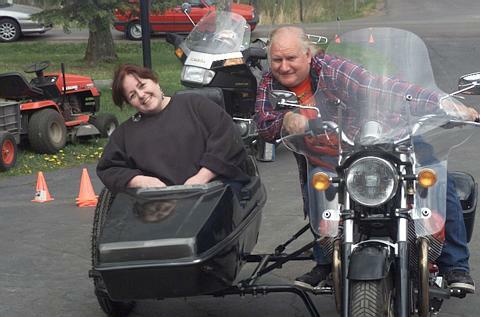 I ended up leaving the bike in the mall overnight and hitching a ride home with a friend and his wife. Picked up the bike this morning. 33 f. and the roads were very wet so by the time I got home I was frozen. Took me most of the day to warm up. 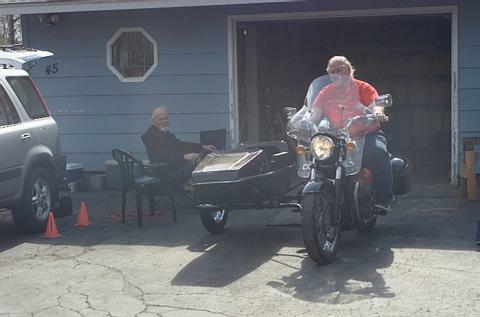 The sidecar arrived today. It is awesome! 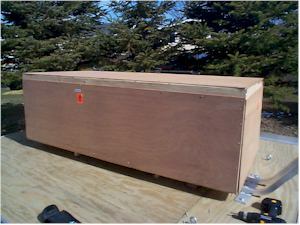 The folks at Dauntless Motors sure know how to make a crate. This thing was solid. 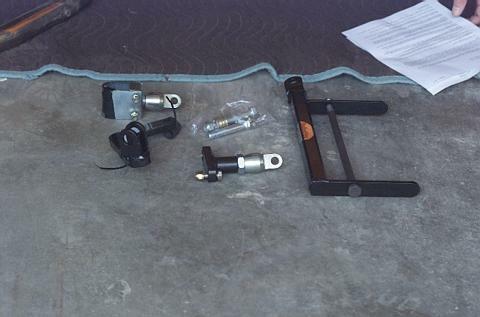 I disassembled it one screw at a time and pulled everything out of the crate. 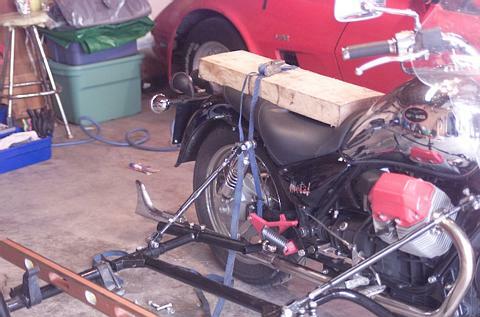 I now have a very nice pile of lumber and another pile of sidecar and parts. While I was there I noticed that he still had my old Jackal sitting on the floor. I was surprised that it hadn't sold yet so I asked what he was asking for it... "$6,300". 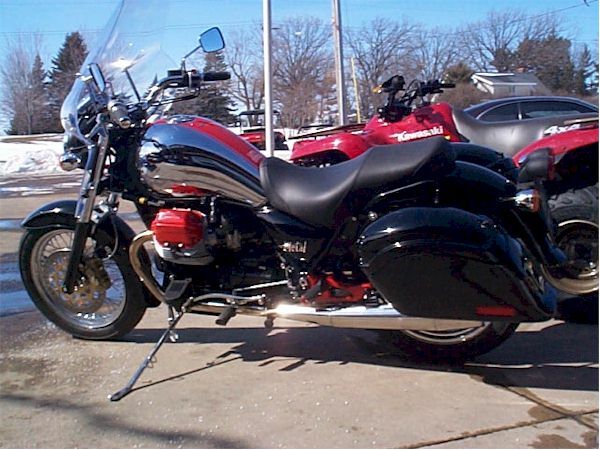 Which sounds like a pretty decent price for an '00 Jackal with only 8,500 miles on it. Heck, it is just broken in, runs like a top, and even has a new tire on the back. I sure hope that it goes to a good home. the car as we had our 4 year old granddaughter with us. Got up to his place around 3:00 PM. 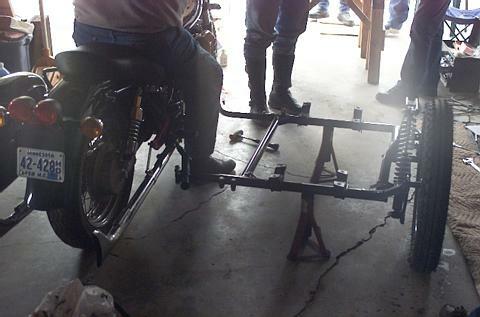 Al Olme and helpers ( I didn't remember names, sorry..) had the frame mounted and busily worked to get it aligned. 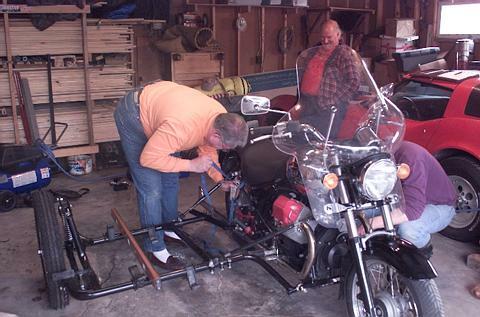 For toe in check, Al used a laser pointer /level tied to the sidecar wheel instead of string and boards. Measuring from the bike wheel string, he could red the laser beam on the tape. Simple and quick, may not be so easy by yourself. Got the car together, looked very nice. Fun to work on a new rig. Sheldon's wife had a great lunch and dessert and lot's of things to drink. Good luck with it. 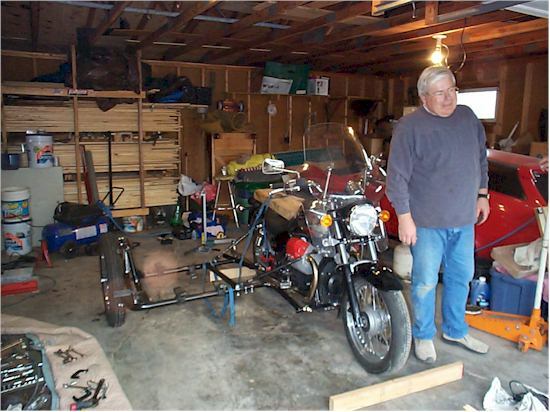 I also gave to grubbygust, Gus Jensen the last collection of newsletters and history of the Third Wheel Inc. Sidecar Club that died in 1987. Based here in Minneapolis, It was the national club before the USCA formed. I was the last president and my wife had done the newsletter for 3 years. Gus and Sheldon can make use of it for various writings. We also will be giving Chris Dodson of Hack'd a copy of what we had of newsletters for possible stories. Well, the mini-rally was a success. It was threatening rain in the morning and there were showers moving around the area but we didn't get any sprinkles until late in the evening. I was expecting the first to arrive about 11:00 so was a little surprised when Al and Kevin showed up at 9:30 and were ready to get right on it. I had been cooking and setting up since 6:00 a.m. and was already hurting when they got here. I've had a couple of health problems lately and was just about worthless the rest of the day. But we had such a great crew. Al is the Man!!!!!!! 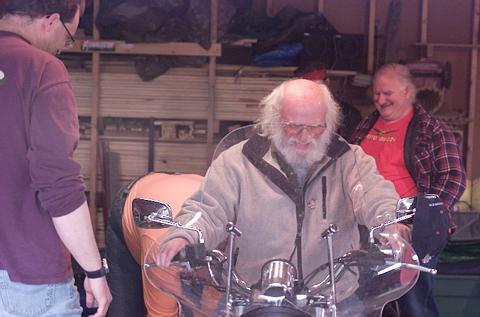 We all learned so very much from him and a few tricks that were new to everyone in attendance. 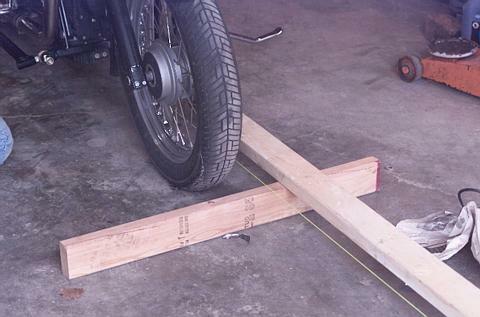 Using the laser carpenter's level to line up the car was a revelation. I'm really glad he got here when he did as we really needed the whole day to get this thing on. 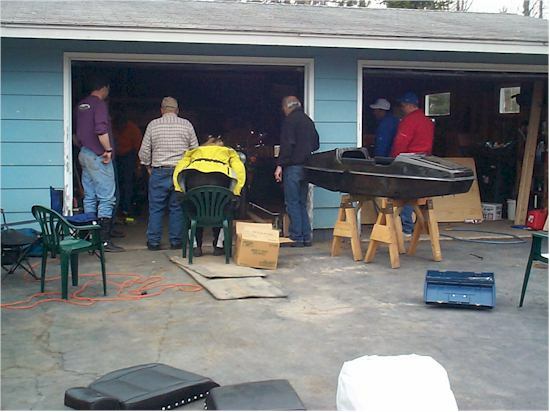 Jim Keal, Gust, Jerry from Superior, Doug, my neighbor Jeff and his son Steven, and a few other people dug right in and helped out. 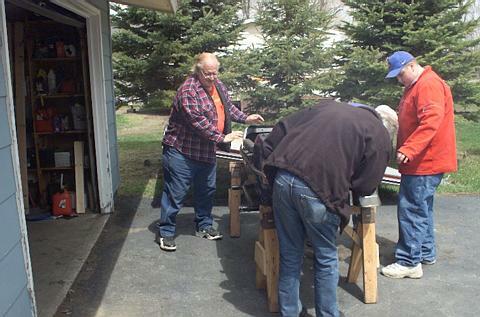 there were also several local biker friends who showed up to offer support and help get rid of the massive amounts of food. I believe there were about 25 people who stopped by and just about everyone contributed something. Kevin and Al took tons of photos and I can't wait to see them. 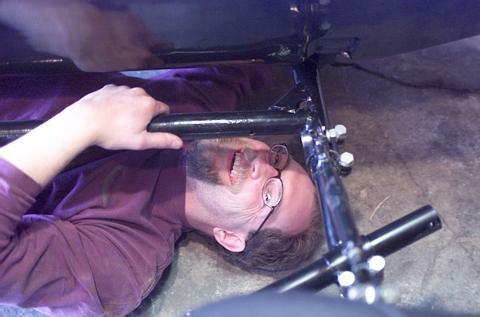 The ones of Jim under the car bolting the brackets on should be priceless. He's 6'4" and about all you could see were his feet. The car is very nice and for being such a reasonably priced car it is very well built. 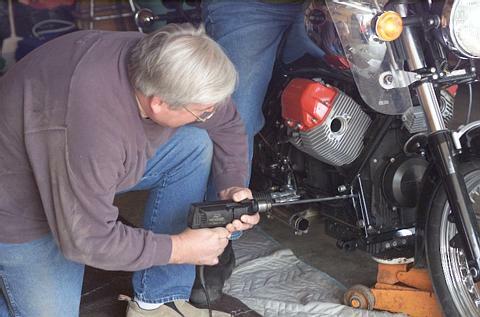 There were several modifications that had to be done to the bike or brackets to make things work on the Stone but nothing drastic. 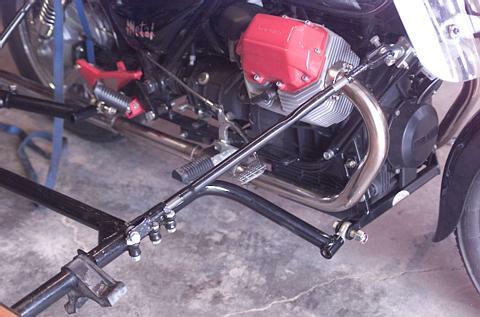 Front lower mounting bracket was in direct conflict to the new kick-stand return spring mounting bracket. The bracket lost the fight with the Dremel tool and was reduced in size by half. 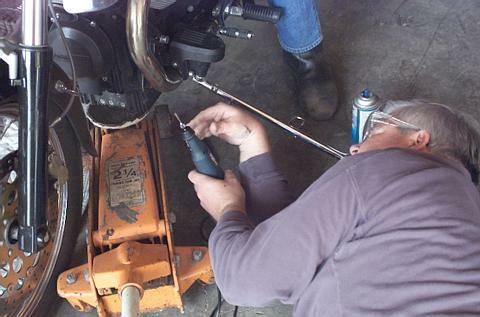 The rear upper bracket had to be modified a bit to make it fit and there were a few parts that needed a bit of grinding or drilling to get them right but all in all it was a great success. 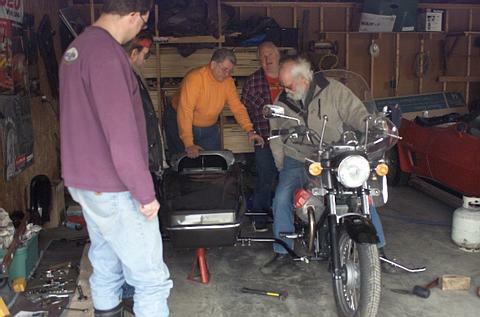 Considering we were bringing together a Russian Frame, Chinese car and Italian Bike it went quite smoothly. Took a lot of time and Al and Kevin started at 9:30 a.m. and the whole crew broke up around 7:00 p.m. 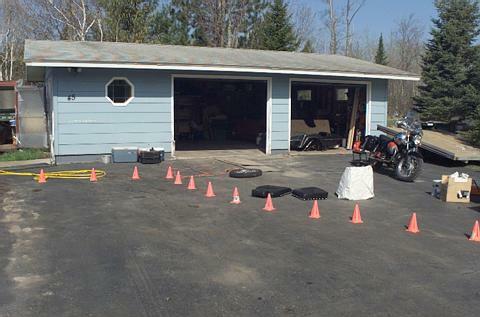 Still to do is the electrical but Jerry Schmitt has volunteered to come by and help with that later this week. The "wife", Patti, made the most wonderful cherry and blueberry desserts and thankfully they didn't eat it all so I have some left for later this evening's treat. We are not married yet but will be on June 8th. 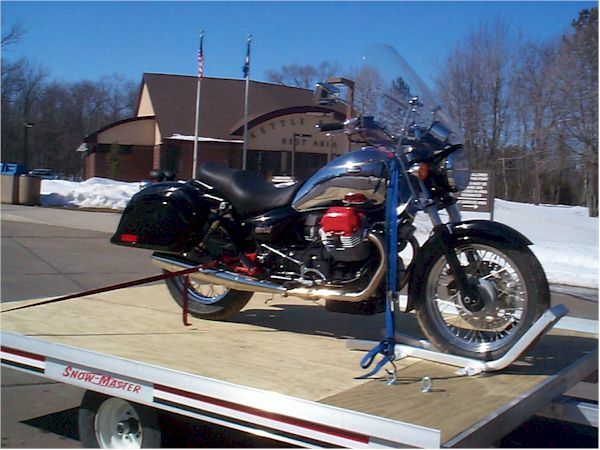 The total price of the car, with the custom Guzzi brackets and shipping from Seattle to Duluth was about $2,100. That is a very good price indeed for a full steel car. The lights leave a lot to be desired as they are single element, made from plastic, ill-fitting, and really, really ugly, but that is the ONLY complaint I have about the car. 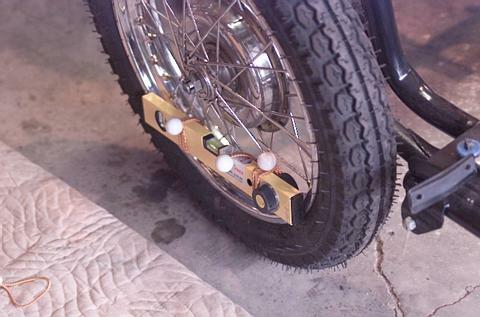 The rubber mountings with adjustable spring shock looks like they will make a very comfortable ride. The high, wrap-around windshield, and high-back seat are going to be very much appreciated by Patti. 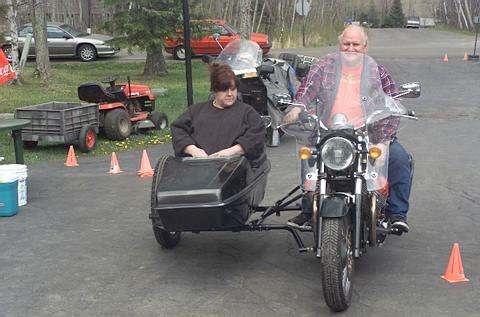 She went for her first side-car ride once the car was mounted and lined up. All the parts were not on it yet but she loved riding in it and is already pressing me to teach her how to pilot it. There are two holes in the top front of the car that look like they would be for a hood ornament or insignia. There was nothing included so I don't know what goes there but Al indicated that leaving it off is a good idea as he though it matched the taillight and was just as U**y. I'll have to ask Jay about that. Someone suggested I mount Jaguar hood ornament there but I may look for something a bit more fitting for the mutt-nature of the bike. Anyone have any suggestions on what would make a proper hood ornament for this rig? 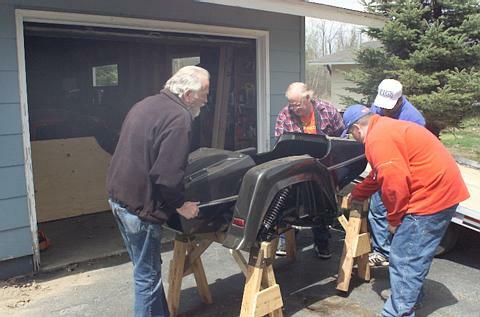 If I hadn't had such wonderful friends come by yesterday to do all the work this thing would probably be sitting in a corner of my garage for years, so a huge thank you to one and all. 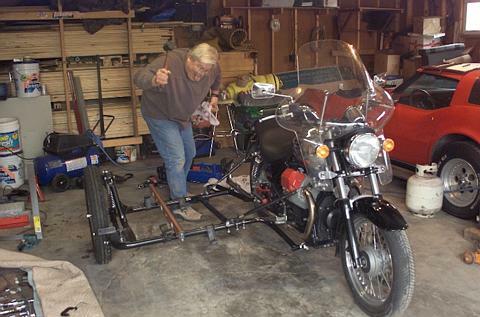 Kevin with Sputnik sidecar frame installed and ready to line-up. About ready to put on the car the crowd watches in awe. Sheldon looks on in horror as holes are drilled in frame parts. Took the bike out for several short rides around the block. There is a very bad front end shimmy at about 20-25mph. If I take my left hand off the bar it just about whips the bars out of my hands. When I have someone in the car the shimmy goes away. It is very pronounced when cruising at those speeds and letting off the throttle. 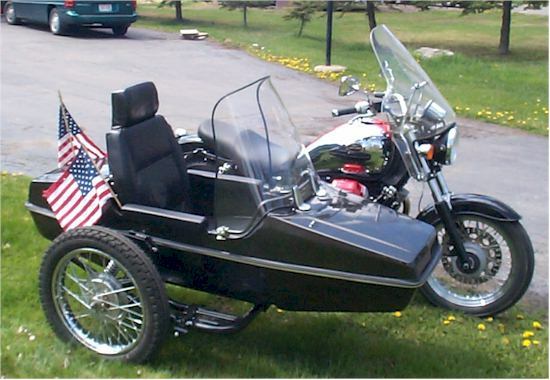 I did take it out on the highway and ran it up to 80mph. It cruises very nicely at 70 but at 80 it feels like it is pushing massive amounts of air and takes large applications of throttle. 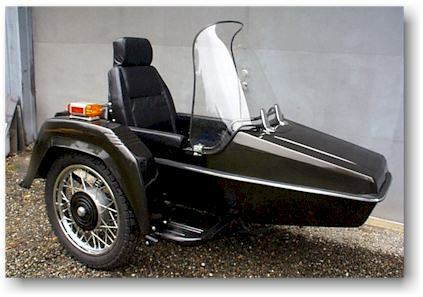 The windshield on the car is huge, which is great for the passenger but I suspect that between that, the car, and the windscreen on the bike this thing is like a brick going down the road. I'm going to try to tighten up the dampener to see if that helps get rid of the shimmy. 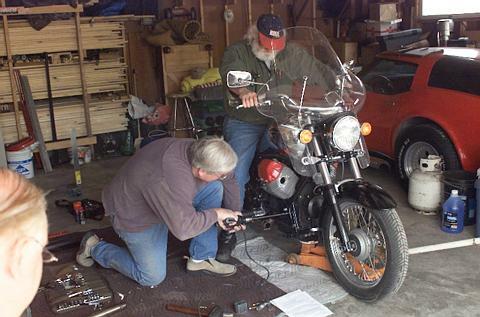 I should also check the sidecar tire pressure. Later in day -- I bumped the front tire pressure up to 42 psi and cranked the dampener all the way and the shimmy went away. An easy fix after all. How often does that happen? Just rode home from a meeting at 10:00 p.m. in the dark. No moon, no street lights, overcast, spitting rain and almost no headlight. I've put 1,600 miles on the bike and this is the first time I've ridden it at night. The headlight was putting out about as much candlepower as say.... a candle. Very, very dim. We haven't touched the wiring yet so the thing is just the way it came. The directional lights, taillights, dash gauge lights and everything else seems to be operating normally. If I hit the high beam, or the flipper beam, nothing changes, just a very dim headlight. Anyone have an idea as to what could cause this? I hate to take it all the way to Caswell's to have it checked out if it is something simple. Jerry Schmitt is coming over tomorrow to help me put lights on the chair so we'll have to see if we can fix this problem also. 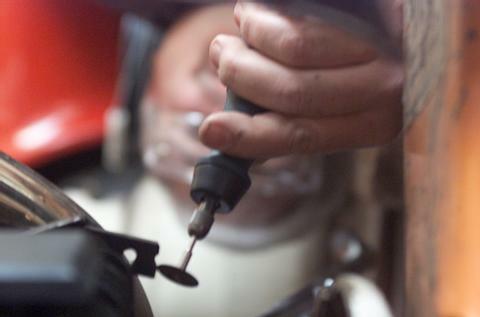 Jerry showed this morning and we tore into the bike but were not able to find out what the problem was. Everything checked out good except the brake master cylinder has an electrical switch on it and one of the tabs was broken off. Finally gave up and put the rig on the trailer. 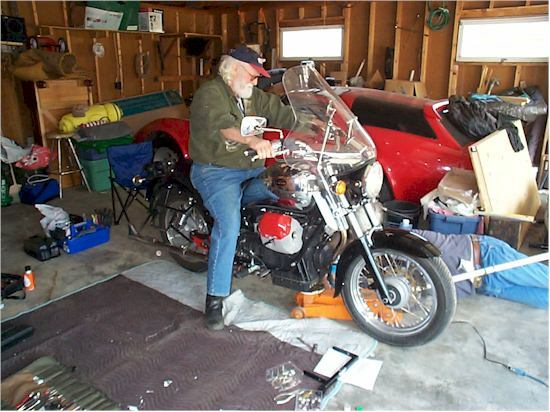 Les Caswell said that if I could get there early he could have his mechanic look at the bike first thing in the morning. 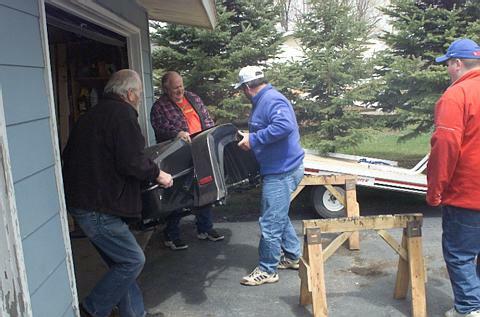 I showed up on his doorstep at 8:30 and he helped me unload it from the trailer. 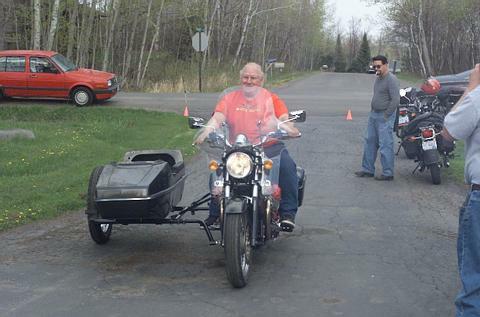 Once unloaded he took it for a ride up the road. He must have liked it as he was gone about ten minutes. Said that it needed a bit more toe-in but other than that it was sweet. 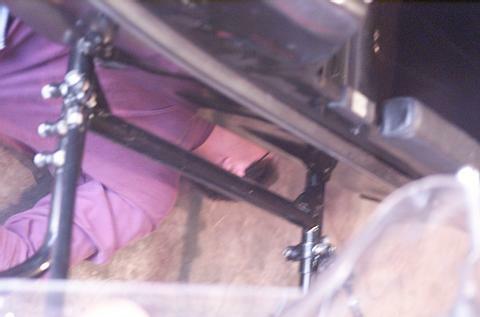 He rolled it in and his mechanic started on it as I drove away to go sit on a picnic bench at nearby Fish Lake. Was very relaxing listening to all the sounds of the water, birds, frogs and whatnot. 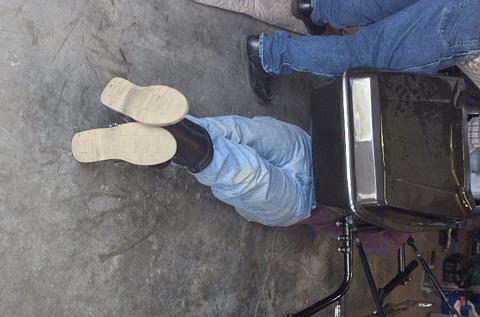 When I returned an hour later the bike was done. It appears that the brake master cylinder has a switch on it and one of the electrical tabs was broken off. This apparently was shorting out and popping the fuses. Brought the bike home and this evening Patti and I took it out for about 1.5 hours of riding around the neighborhood. We put on about 40 miles mostly at putting around speeds, but did hit 60 at times. The thing has a bit of a pull to the right so I suspect Les's comment that it needed a bit more toe-in is correct. I guess I will have to figure out how to do that. Patti loved it. This was her first real ride and she grinned most of the way. It was very rewarding to see that she liked it and to have her now going with me on my little evening putts. one of their deer any day. I was all set to leave about 9:00 am but it started to drizzle rain so I didn't pull out until 10:00. By 8:00 most of the 315 people that were in attendance had packed up their wet camping gear and hit the road. We had several days of incredible weather so the heavy rain at 4:00 am Sunday morning just was a nice ending to a wonderful event. I did learn that the Taj-MaMall wasn't waterproofed though. Usually I camp with a very small tent that I can't even fit my bags in with me at night. It is so small that short little me even has to lay corner to corner in it to fit. Another nice thing about the recent wedding is that Patti came with a six-man tent! And it packs up quite small. She hasn't used it in a few years so I packed it with. Only problem is that it appears it has never been waterproofed, and it seems the thing is so big that it even had an indoor pool. How many tents have that, eh? I'll be setting it up today, drying it out and waterproofing it. and did the job himself. 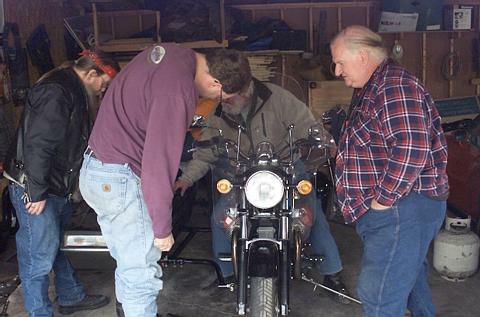 It is great having friends who are familiar with wrenches. It was incredible having over 300 people there. 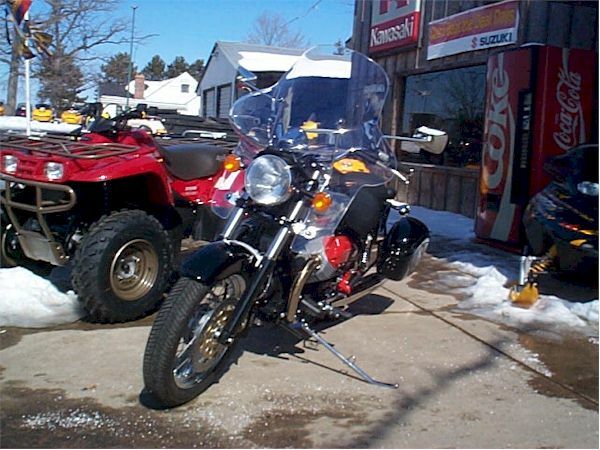 We had great rides, fantastic eats (although they have to go a long way to beat the Minnesota rally <chuckle>), almost perfect weather, and the most amazing thing to me, NO MOSQUITOES. In three days I did not see one mosquito. It was wonderful seeing old friends and making new ones. The campground had the nicest showers I've ever seen at a campground, a private lake with swimming beaches and stocked with fish. I did take advantage of the lake to cool off Saturday afternoon. 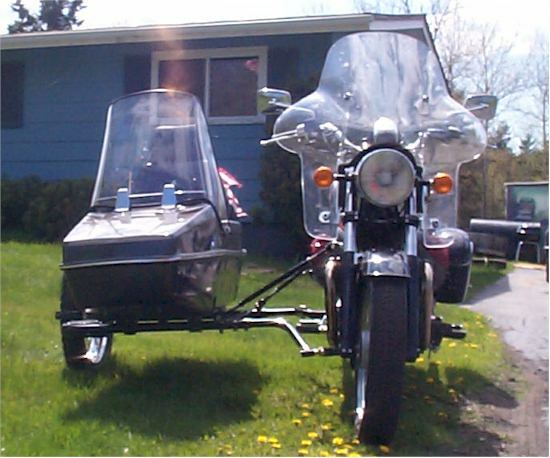 I won a pass to the 2003 Illinois rally in the doorprize drawing and with 8 sidecar rigs there I took the "Long Distance Sidecar" award and won a free pass to the 2003 Wisconsin Rally. 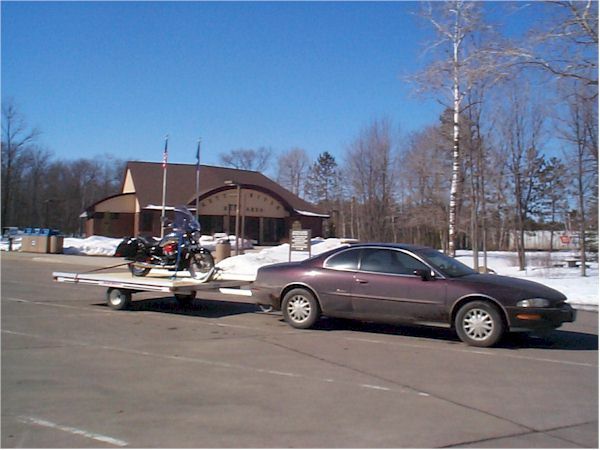 I hope that ends the seemingly endless bashing I've been taking for trailering to the 2002 Illinois rally!!!!!! 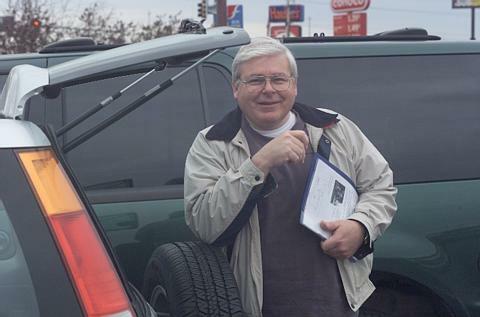 It might help that I now have photos of Dan Prunuske riding around in an SUV. Also caught Cheesehead in a Harley Davidson golf cart, which is an incredible bit of irony. It was a great time and barring disasters I will be there again next year. you all on the Minnesota Rally, August 16-19. Monday September 2, 2002... It's been a busy summer. 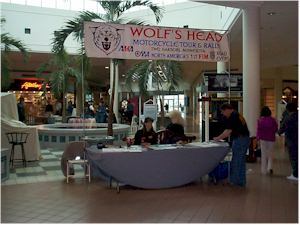 The Wolf's Head Rally in July was a great success with almost 1,000 participants. http://www.wolfsheadrally.com Attended the Illinois Moto Guzzi Rally, the Wisconsin Moto Guzzi Rally and the Minnesota Moto Guzzi Rally, hit half a dozen smaller motorcycle get-togethers, and generally had a great summer. Patti and I get along great and married life is wonderful. 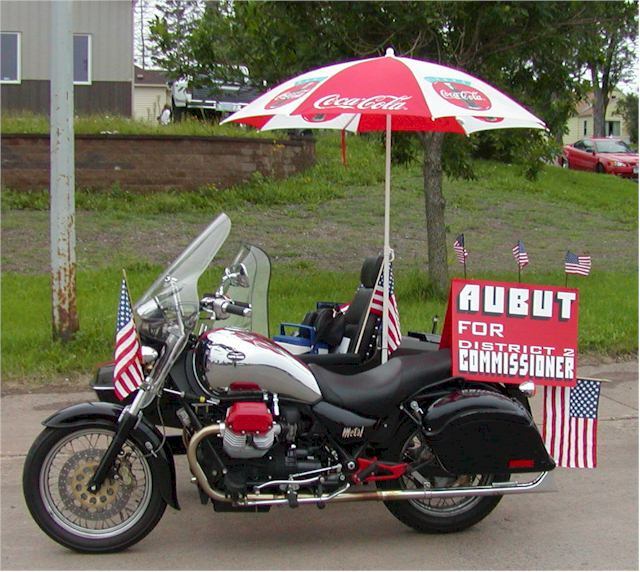 My newest big adventure is that I am running for County Commissioner in Carlton County Minnesota, don't know if I have a chance of winning in a Finnish community against a guy named Liupakka, but I'll sure give it a valiant effort. 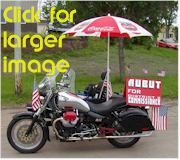 Today I ran the rig in the Cloquet Labor Day Parade. 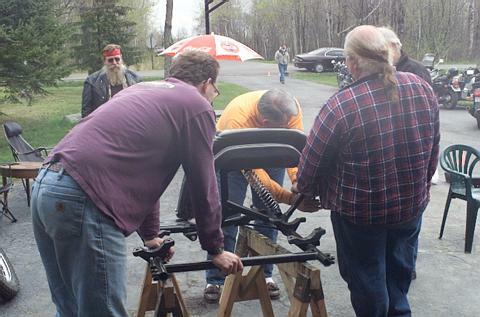 Had a blast and the rig, with the umbrella up, sure attracted a lot of attention. I've been riding quite a bit this winter. Temperatures have been about twenty degrees above normal, although just yesterday they finally dropped to normal and we had -7 f. last night with a 30mph wind. Wind chills were in the -40 range. 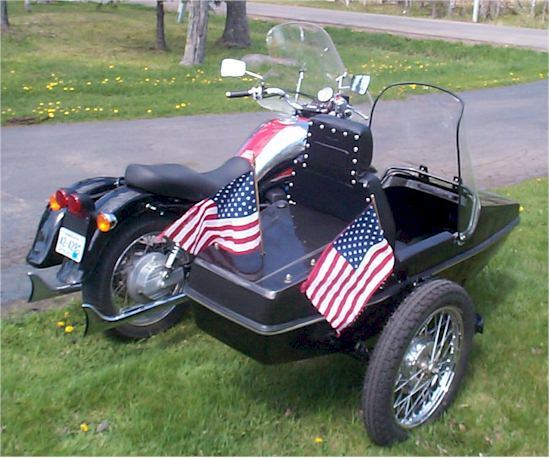 Had sent my sidecar seat to Rich Maund at Rich's Cycle Upholstery in Virginia a week ago and it arrived back yesterday. I installed it in the bike and posted photos here. 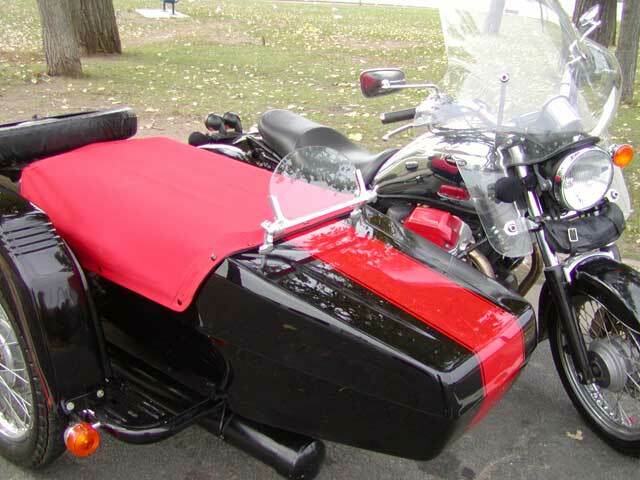 The back is actually a Ural seat back that a friend had given me. Works great in the Flying Tiger and is a lot lower, and therefore much less of a drag, than the stock one. It really came out nice. 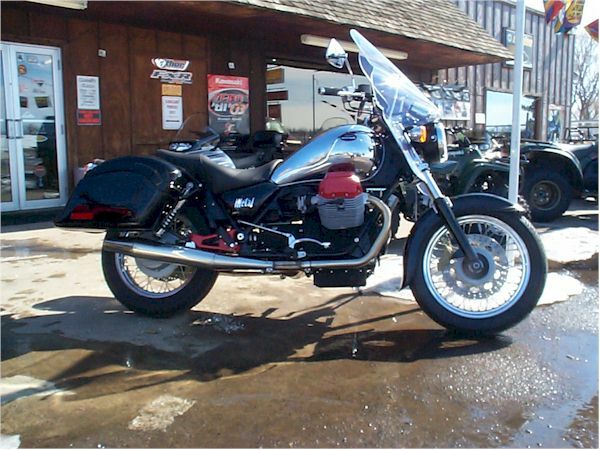 As some may know a couple years ago I sold both my Urals and bought a Guzzi Jackal, then the Stone Metal, so that I could have something very dependable that I could run all day at 80mph on the freeways as I had a 50 mile a day freeway ride to work. 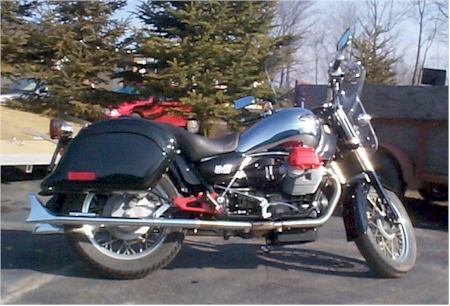 The Guzzi rig is wonderful, will cruise easily at 80mph and is really a blast to ride. 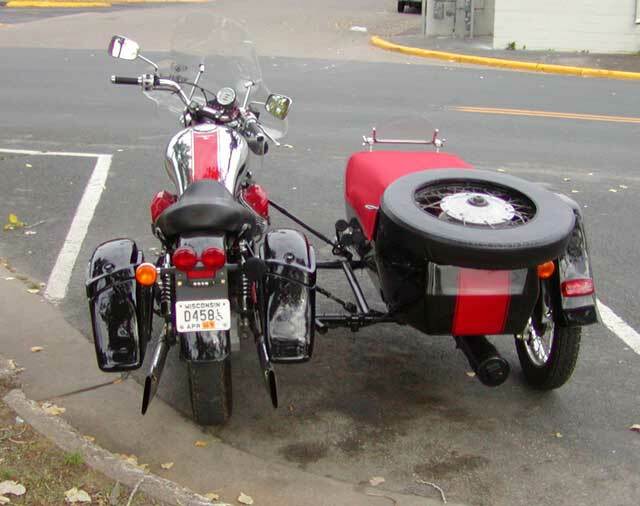 About as rare as a motorcycle can get and it draws almost as much attention as my Ural Sportsman did. BUT... Today it was 17 degrees with a fresh 9 inches of snow on the ground. 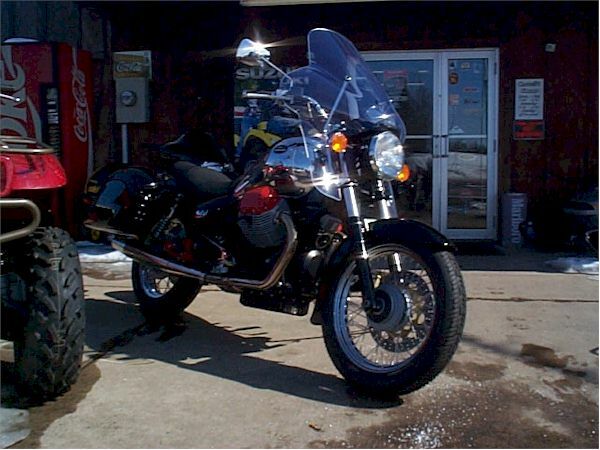 Took it out for about a 30 mile ride on snow and ice covered roads. It was not the best experience. 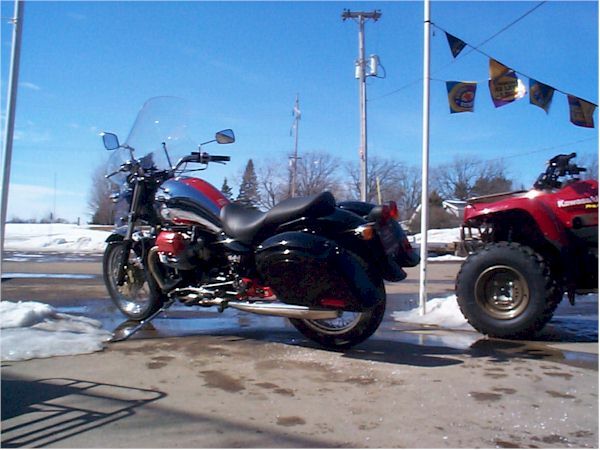 Because of the location of the driveshaft I'm limited in the size of tire I can use and with sport bike type tires it was really squirrelly and even in a couple of inches of snow I could barely move. 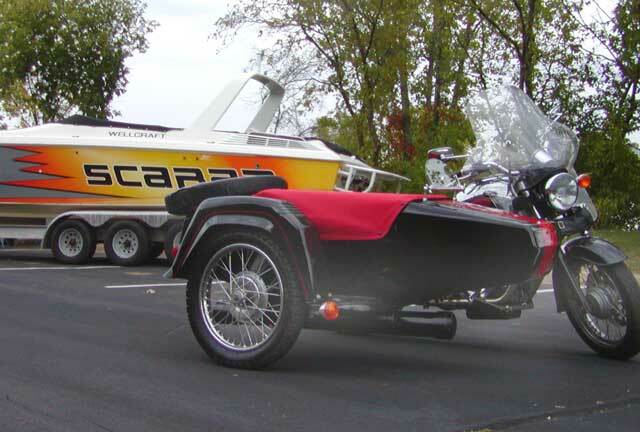 I love the bike but I'm really missing my Sportsman. 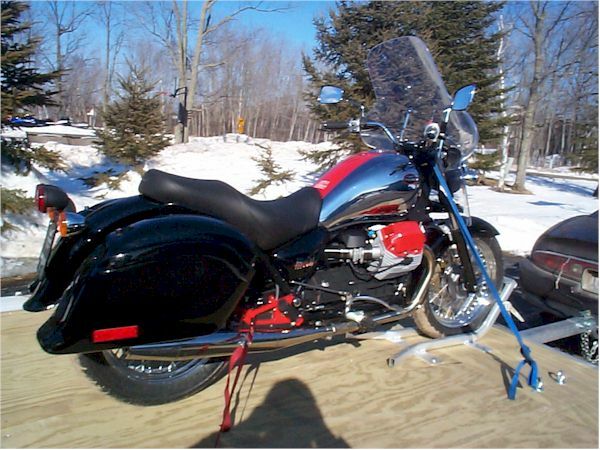 St. Croix Harley Davidson, the local Ural dealer, is only 15 miles from my house. 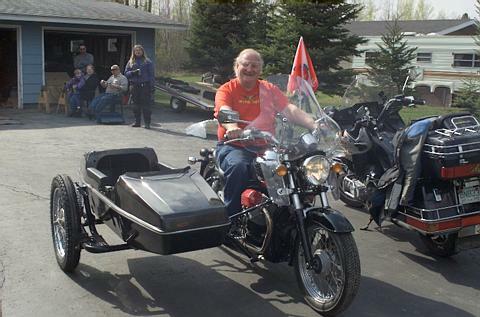 I was up there a couple weeks ago drooling on the Urals and when I got home today I called Del to ask about the 1998 Sportsman, with all the options, including electric start, that only has 1300km on the ticker. He said, "Why don't you consider the new Patrol I just got in. 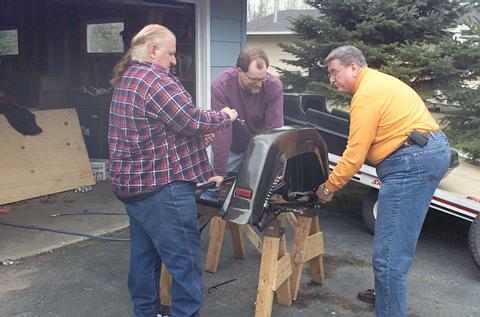 It's got the front disk and the works." Oh my, oh my, oh my... I'm going up there tomorrow to take it for a ride. 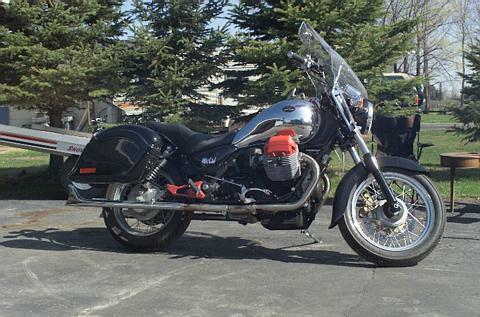 I've decided to get another Ural two-wheel-drive rig and I'll probably pick up an old Moto Guzzi Ambassador for some summer riding. These photos were taken after Gilby from "Gilby's Street Dept." did his magic on it. 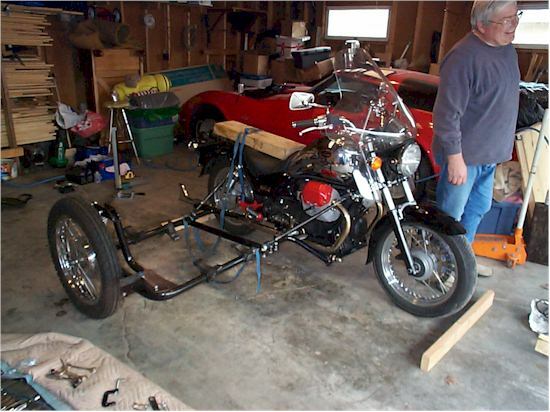 He took the light off the top of the fender, repainted the sidecar frame, moved the rear/top mount so that he could finally install the inside saddlebag. 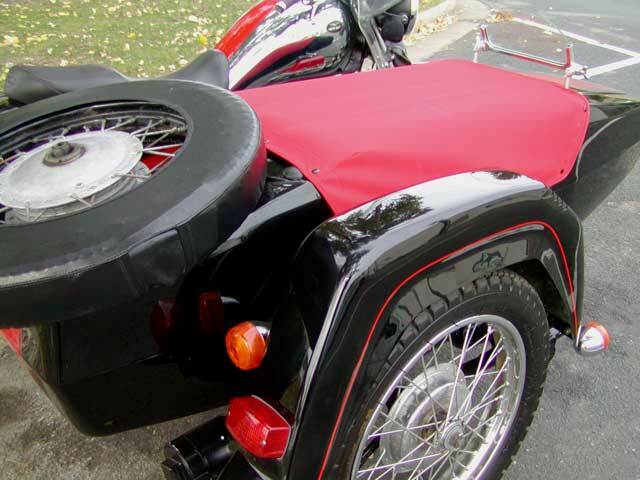 There was a rubber bumper all the way around the sidecar that covered a ridged seam where the top and bottom halves were joined together. 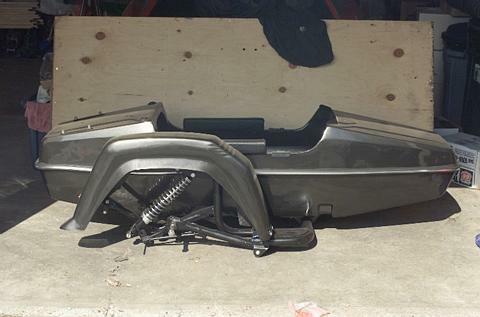 Gilby ground that seam off, welded it and filled and made a great body accent line there. 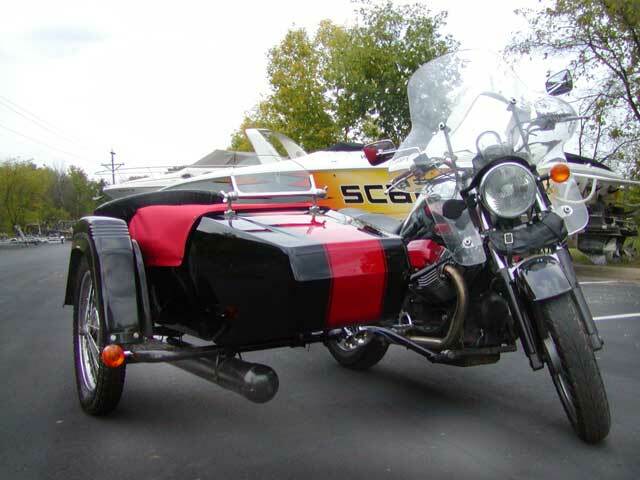 He also mounted my 135db air-horn, painted the sidecar in deep, luxurious black and put a red stripe on the car to match the one on the bike. 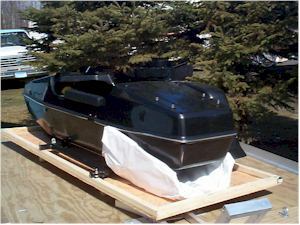 The car was originally a very, very dark green that masqueraded as black and was sun-faded on the top. The red stripe I had added by a pin-striper a year ago and he did the whole thing with a small brush and it looked terrible, like someone had painted it with a house paint brush. 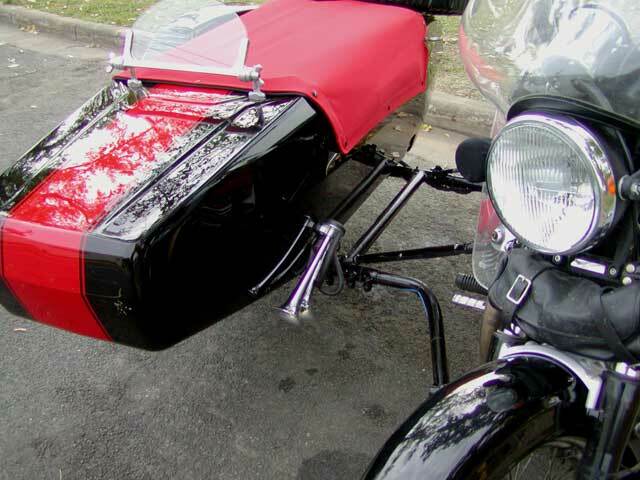 Because Gilby had removed the ugly plastic directional light from the top of the fender he also mounted motorcycle-style directional lights on the sidecar. I love the results. 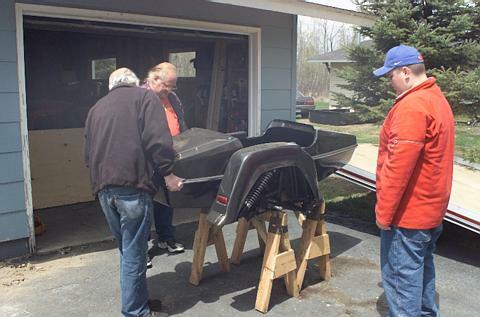 Then, to tie it all together I called the local marina and asked who did custom boat covers in the area and they gave me the number of a Mark Brown and said he did great work. 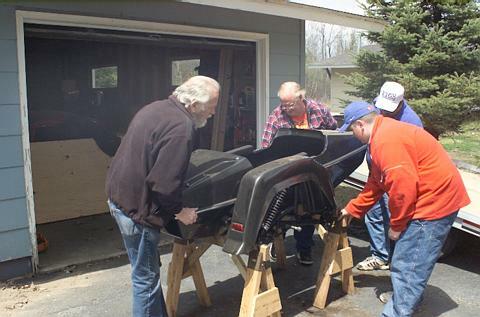 Called him and he came to my house, gave me a quote and after Gilby did his thing Mark came back with the material, installed the snaps, went home and sewed the tonneau cover, came back and installed it. 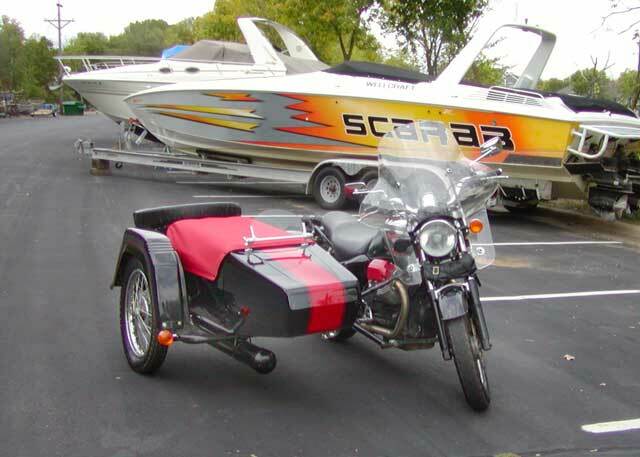 It is made out of the highest grade of boat cover canvas with vinyl on the back, and in red and he put on black snaps and the whole thing is now one incredible rig. 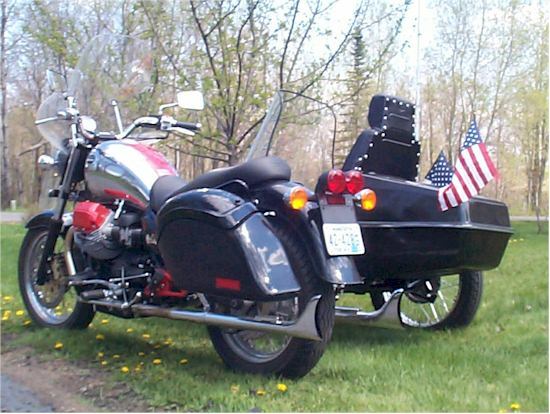 I bought a Ural Patrol last winter and at the 2004 Wolf's Head Rally the manager of the Lake Country Fairgrounds and her husband fell in love with it and bought it out from under me. 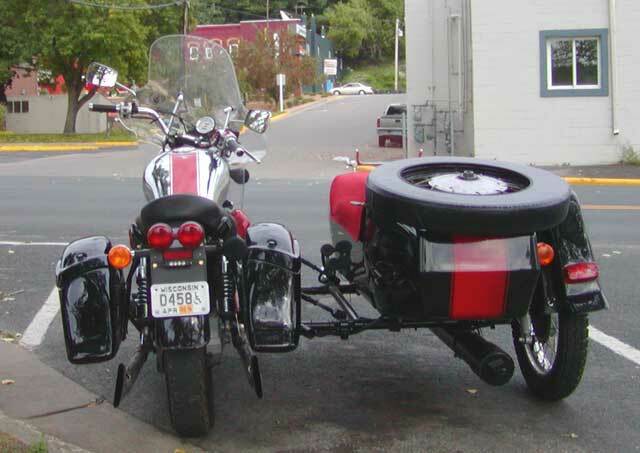 So then I decided to just keep the Guzzi rig and put a bit more money into it to make it my perfect rig. We are having an unusually warm winter. It is 40 degrees here and what little snow we had is melting quickly. 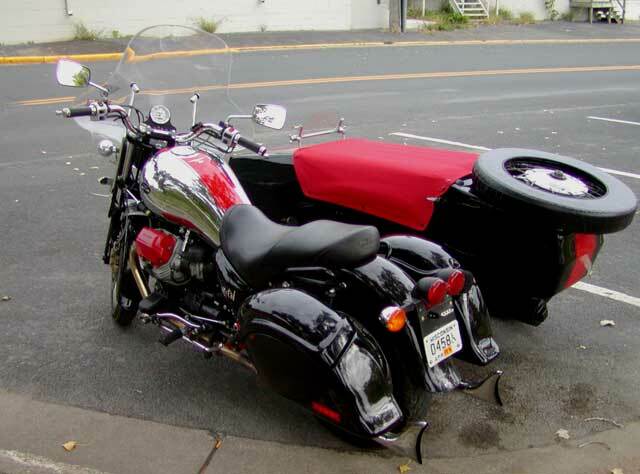 The bad thing about having re-done the sidecar is that now, for about the first time ever I'm not riding just about every day, only those days when the roads are dry and clear. Everything is wet and salty today but I may just make an exception and go for a ride then hose it off when I get home. 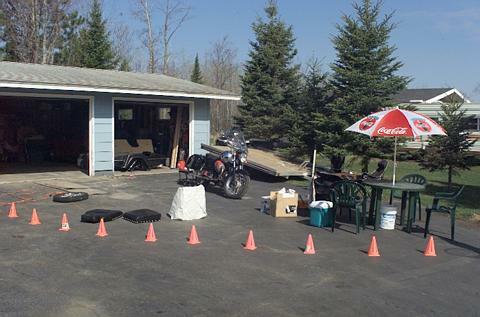 If I do this before it gets dark the bike will have time to dry in the sun before I put it away. 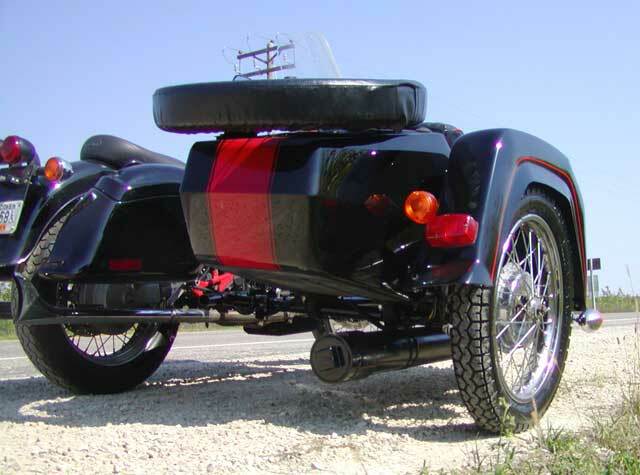 I miss the Ural. Was nice to have a rig that could handle just about anything. 07/22/06 - Sold! Explanation here. 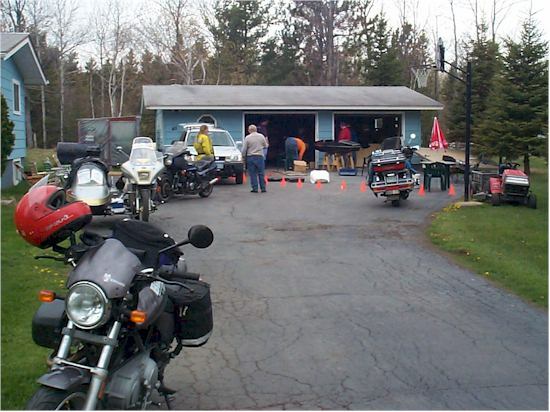 The Moto Guzzi National Owners Club sponsored a relay around the United States and the Wisconsin/Minnesota hand-off was done at our house. Photos here. Lots of water has passed under the bridge since my last update and life has certainly flowed by for us. 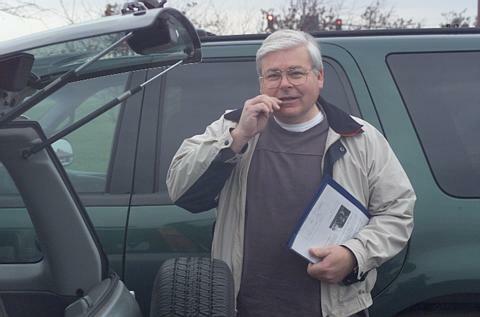 I lost some weight, started to feel a bit better and found a perfect brand-spankin' new 2006 Chrysler Crossfire Roadster. You can see it here. It was awesome and I absolutely loved it and for a time I had both the SLK and the Crossfire, then sold the SLK as I found myself driving the Crossfire all the time. Then my health sort of crashed and I was losing the use of my legs. 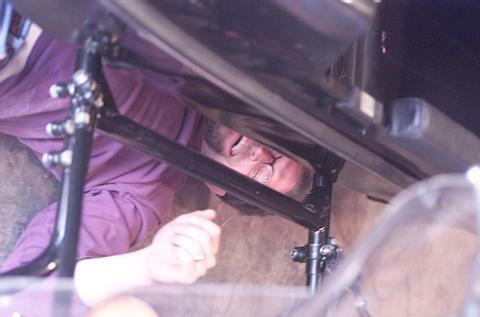 By the fall of 2008 I had to rely on crutches or a wheelchair to get around. I was in a world of hurt. Up till then my doctors had not wanted to do surgery on my leg for fear of what could go wrong. It was not your normal leg in that when I was ten years old I'd had an experimental surgery on my left (my good) knee that made it tough for them to predict the results if they'd started chopping. Here is that info. For questions or comments about this site please e-mail webmaster.